It is over! 2014 is in the books and we have crowned a champion. Eric Hellmuth driving his crazy red super beetle took the title over some VERY tough competition in the 2014 VW Heritage Series. With a series shortened to only two races due to rain, we all knew points would be tight. But what we wound up with was a VERY tight bunch when all was said and done. Our last race at Englishtown NJ October 19th had 16 cars show up for I/Gas with each driver wanting that win. Race sponsors for the event were JK enterprises and PEP transmissions. Cold temperatures proved tricky for some as the air was only 53 degrees and under cloudy skies, the track did not have all of its teeth! 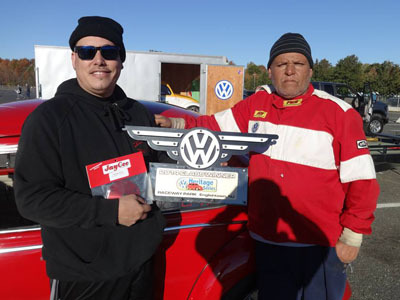 In what was a survival of the fittest, the final round came down to New Jersey drivers, Steven Pocaro Sr. vs. Nelson Rodriguez Jr with Nelson taking the win in his street car. The point’s winner Eric Hellmuth had a few rounds lead coming into the day and he was able to maintain that as his total was 67. 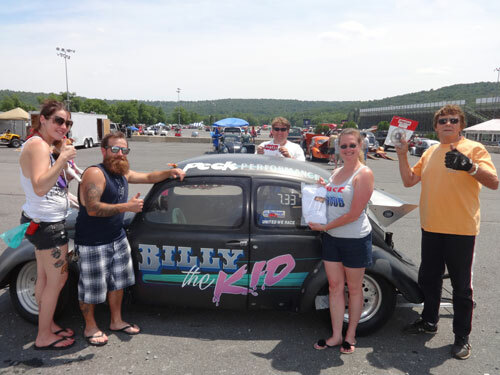 First of all we want to thank everyone who made it out to Maple Grove on Sunday June 8th for the June Bug event. We especially want to thank Gene Ulrich for helping to keep this event going and for providing the payouts to the racers. Without Gene, we would not have a place to race. This was our first race of 2014 and we had 17 I/Gas cars through tech and 16 make it to round 1. We would have had 20 but a birth, family sickness and technical difficulties had us fall just a bit shy of our goal, while still expanding on our 2013 numbers. After a few rounds of racing were completed, Joe Koenig driving his brother Ryan’s street legal, all steel bug was our lone semi finalist as he went red against Eric Hellmuth. Pete Peek got the bye, setting up our finals. Our last race of the day pitted the ageless Pete Peek driving Billy The Kid and Eric "Super" Hellmuth in his red super beetle. Eric left first with a 7.71 dial in, which left Pete to chase with his 7.31 dial in prediction. Unfortunately it was Eric getting there first, but a bit to fast going a 7.69 on his 7.71 dial, handing Pete the win. Even though Pete got the event win, he lost in round 1 and had to buy back in which gives Eric the points lead heading into event #2 at Capitol Raceway in Crofton Maryland on August 23rd. With a large turnout expected and more rounds of racing then usual, Capitol should be a good place to break up the tightly bunched field and give someone a chance to pull away with the points lead. Be sure to thank our sponsors for the race as they were Gene Ulrich from www.ulrichusedcars.com located in Mohnton, PA and Ryan Koenig who owns www.laserservicesolutions.com .